The City Council’s Overview and Scrutiny Committee carries out regular reviews of various aspects of City Council policies and their meeting on 8 March 2017 focused on cycling and the draft new City Cycling Action Plan for the next 4 years. In advance of the meeting Pedals was invited to submit one page of comments as a stakeholder, as were RideWise and Highways England. Here is our submission. 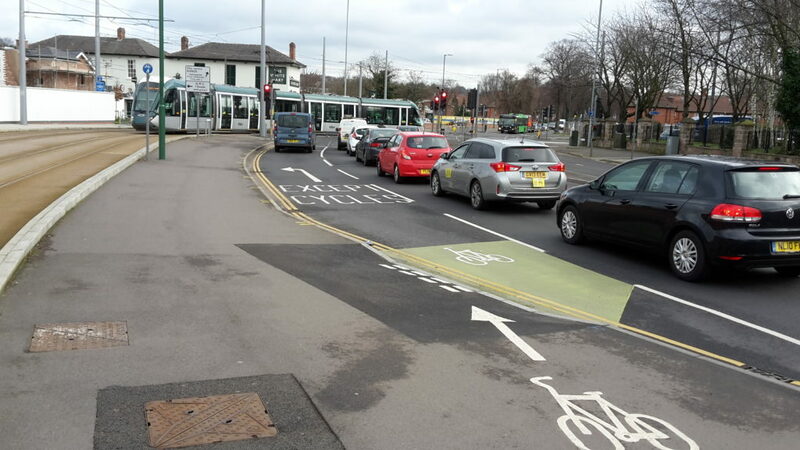 Pedals welcomes the commitment to higher standards of cycling provision, as in the recently adopted Nottingham Cycling Design Guide, provided that it is kept up to date and reflects the latest developments in best practice. The Western Cycle Corridor in general is of much higher standard, e.g. 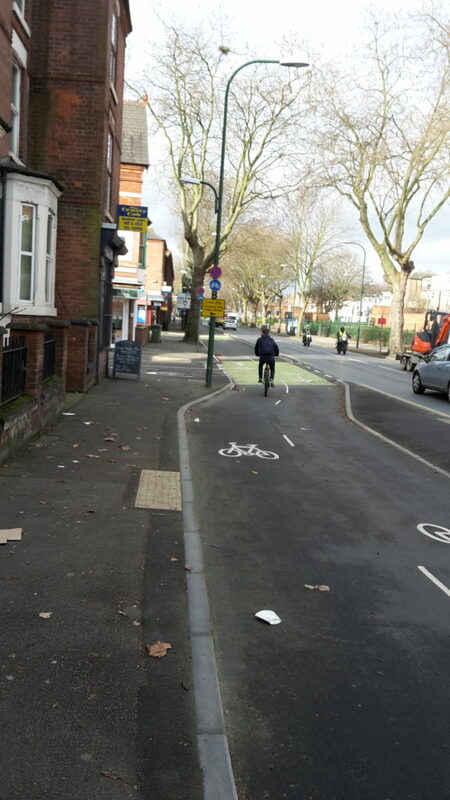 wider paths and with more cycle priority at junctions but has some more problematic areas, e.g. 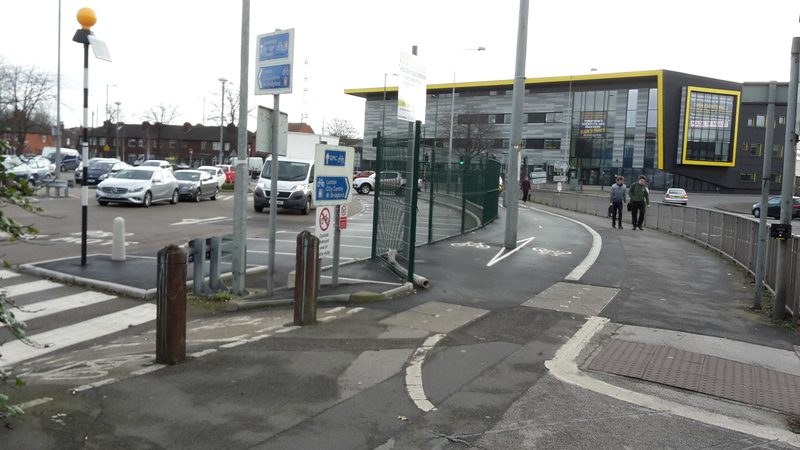 at Gregory Street junction, on the Abbey Street cycle path by the QMC, and some issues with the new signals at the Castle Bridge Road junction. Safer connections at the east end to and past the Broad Marsh area and to and from Nottingham Station are also vital. We much welcome the new connecting route between University Boulevard and Thane Road (Boots Enterprise Zone) including the new bridge over the railway etc. 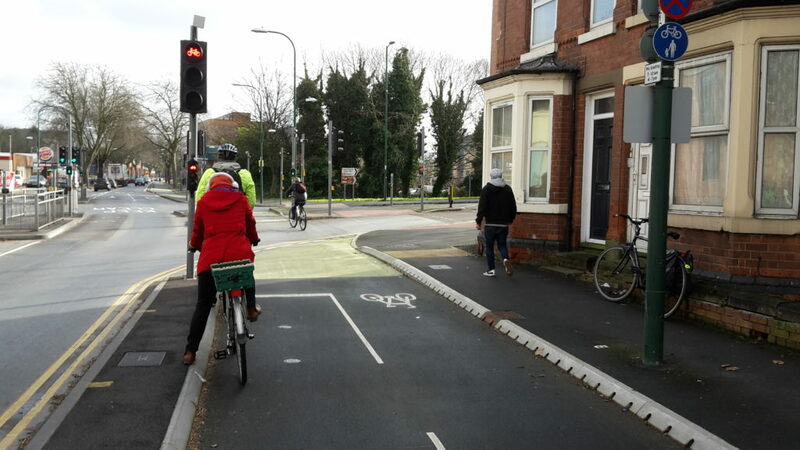 The Eastern Cycle Corridor is also very welcome but will only achieve its full potential with more links, especially across the Island Site to and from the City Centre, Canal Street and Nottingham Station. Southern Cycle Corridor. Much reliance on the recently built tramside paths but part of these are distinctly substandard and will need upgrading as part of a higher standard route. This route would also achieve more with wider links, e.g. to and from the proposed major new housing development S of Clifton and to and from Rushcliffe Country Park, etc. Needs close collaboration with the County Council and Rushcliffe BC, as well as Highways England. Close collaboration with the County Council, Rushcliffe BC, and Highways England also needed on the SE side of Nottingham with improved cycle links across the Trent to serve the major new housing developments E and S of West Bridgford, e.g. our proposed new foot-cycle bridge between Trent Lane and The Hook, with upgraded and extended connections on both sides of the river, particularly extended riverside paths between Trent Bridge and Colwick Park, etc. Such a facility would provide much more attractive cycling conditions than on Trent Bridge and Lady Bay bridges, with their very serious congestion and air pollution problems, and would also to do much to help promote cycle tourism, as well as being of great appeal to walkers, especially in terms of providing much better connections between the Colwick Park, Colwick Woods and Holme Pierrepont areas, and other major leisure attractions. Growing concern with the very serious health effects of traffic-generated poor air pollution and the need for cycling (and walking) to be seen as part of the measures required to address this, not just cleaner buses and motor vehicles and tram route extensions. Growing interest in e-bikes and their value in encouraging longer trips and cycling in hillier areas and by older people. This could do much to encourage cycling in hillier areas of the city. We would much welcome expansion of the Citycard hire bike fleet to include ebikes to help promote this new dimension of cycling. Need for upgrading of many older substandard cycle facilities, e.g. 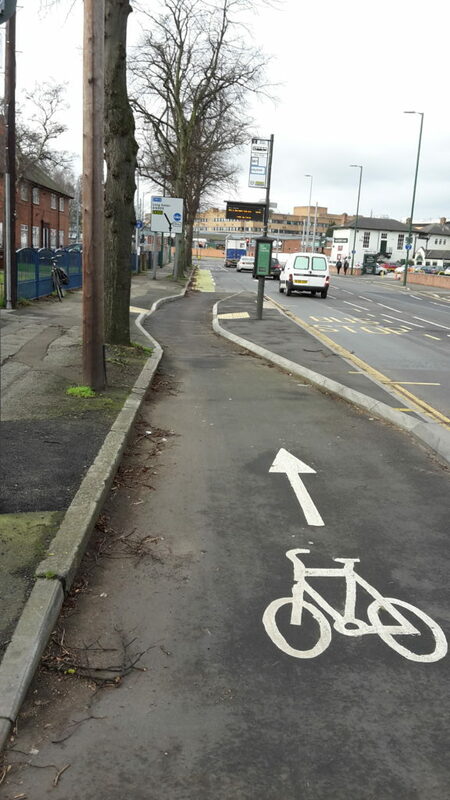 narrow cycle lanes, A-frame barriers and inconspicuous bollards on off-road paths. Need for all (major) transport, planning, regeneration or traffic management schemes to consider likely impact on cyclists and how cyclists might gain advantages from rather than be disadvantaged by such schemes, including any future NET extensions, especially on-road tram schemes, learning more from the detailed experience of all three existing NET lines. Lower speed limits, and proper enforcement of speed limits, vital for promoting the safety of vulnerable road users, particularly cyclists and pedestrians.